The human race has begun to explore the stars, and the frontier is everywhere. 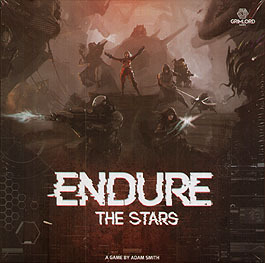 Endure the Stars is an epic Sci-Fi adventure board game for 1-6 players set on an exploratory space ship, the N.W.E. Hikari. Take on the role of one of the surviving crew, battling to stay alive on a once thriving ship, now in ruin. The GEPS, genetic experiments that were being developed to explore the Hikari's destination planet, have escaped and now run rampant. Play from a selection of 12 exciting missions, either as standalone experiences or campaigns with multiple paths, in a struggle to keep the last surviving humans aboard alive. The enemy GEPs are controlled by the game itself using simple, easy to understand dice mechanics and are represented as radar tokens until you finally lay eyes on them, so you're never truly sure what lurks in the deserted halls of a ship that is now your prison. Find weapons, armour, and useful items as you explore the derelict halls, but always be aware that the ship is in a constant state of decay and is prone to malfunction. Lockdowns, blackouts, and gravity failures are but a few of the potential disasters ahead. Even the sanity of your fellow survivors may prove your downfall. An epic fight for survival awaits you! Will you be able to endure the stars?